more things i’ll miss about summer… | i made it so. hope you’re enjoying the weekend… off to enjoy mine. 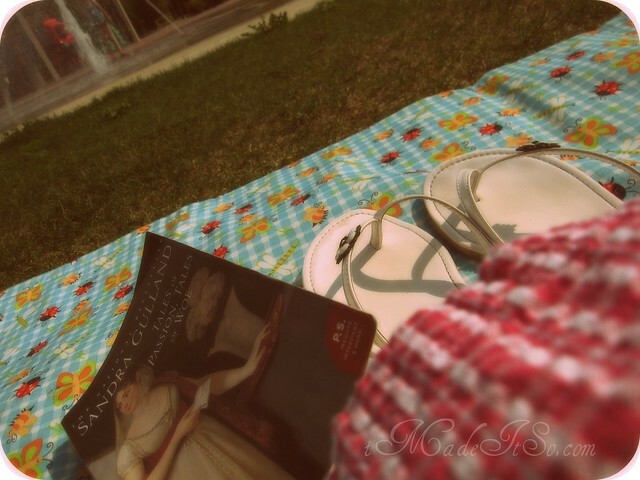 This entry was posted in thinking out loud and tagged books, flipflops, parks, picnics, summer. Bookmark the permalink. I too will miss the laziness that comes with summer. Great photo! I vote that your area gets a longer summer. Do you really feel Fall around the corner? It is still 6-8 weeks away for us. We are in the “Dog Days of Summer” right now. August is our hottest month. Autumn is my favorite season too, Not as hot as summer but not yet winter, just a beautiful in-between of changes with nature showing off it’s reds, yellow and golds. I am looking forward to it. I think I’ve been rushing autumn. The heat has usually gotten to me by this time of year, but I loved your post! It made me step back and be thankful for the good parts of summer :) Thanks!